Ralph Vaughan Williams believed deeply that a composer should be national and that their music should be a vital component of the British soul. 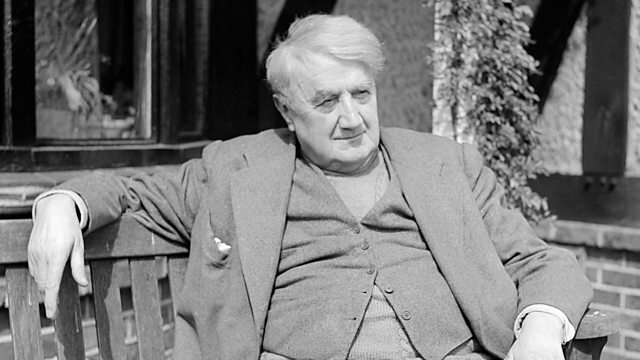 Ralph Vaughan Williams was a composer with a self-consciously national voice, who nonetheless believed passionately in the importance of localism. Indeed, he saw healthy music-making in each community as the ultimate source of national musical vitality, and longed for a time when every major town in Britain would have its own orchestra. His respect for folk music and well-known use of traditional melodies reflected a strong response to places, and the people he met there. This week, Donald examines five key locations which were significant throughout the composer's life. "The man that hath no music in himself, Nor is not moved with concord of sweet sounds, Is fit for treasons, stratagems, and spoils; The motions of his spirit are dull as night, And his affections dark as Erebus. Let no such man be trusted. Mark the music." Vaughan Williams chose these words of Shakespeare for his Serenade to Music, a work which in many ways encapsulates his musical philosophy. Orchestra: English Symphony Orchestra. Conductor: Stephen Darlington. Choir: Christ Church Cathedral Oxford Choir. Performer: Charles Tunnell. Orchestra: English Chamber Orchestra. Conductor: Matthew Best. Singer: Sir Thomas Allen. Ensemble: Corydon Singers. Singer: Elizabeth Connell. Singer: Anne Dawson. Singer: Linda Kitchen. Singer: Amanda Roocroft. Singer: Sarah Walker. Singer: Catherine Wyn‐Rogers. Singer: John Mark Ainsley. Singer: Maldwyn Davies. Singer: Martyn Hill. Singer: Thomas Allen. Singer: Alan Opie. Singer: John Connell. Singer: Gwynne Howell. Orchestra: English Chamber Orchestra. Conductor: Matthew Best. Orchestra: Royal Liverpool Philharmonic Orchestra. Conductor: David Lloyd-Jones. Choir: Royal Liverpool Philharmonic Choir. Ensemble: Edvard Grieg Kor. Orchestra: Bergen Philharmonic Orchestra. Conductor: Sir Andrew Davis. Choir: Bergen Filharmoniske Kor.